Marine Corps Capt. 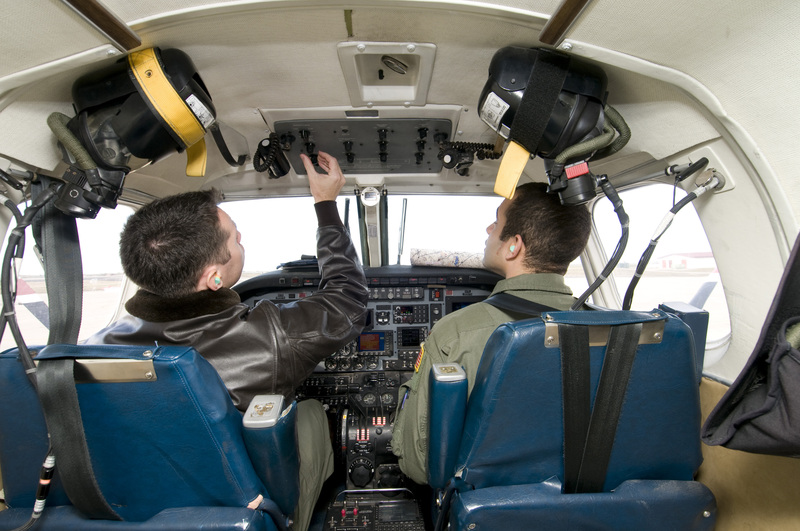 Chris Latimer, left, an instructor pilot for Training Squadron (VT) 31, and Ensign Marvin Smith, a student naval aviator, conduct pre-operation procedures before a training flight in a T-44C Pegasus aircraft on Jan. 12, 2012. US Navy photo. The Navy is creating a Professional Flight Instructor (PFI) program that would allow pilots and naval flight officers to remain in the Navy later in their careers as flight instructors outside the normal sea/shore rotation. Announced today in a NAVADMIN message, the PFI program is meant to address both readiness and retention challenges the naval aviation community faces today. “As Naval Aviation faces several inventory challenges, especially in the [tactical air] community, our ability to fully man both production and operational billets is increasingly challenged. We are fully engaged in reversing this trend along multiple fronts (e.g., improving F-18 readiness, increasing production capacity, enhancing incentive programs, expanding professional/personal growth opportunities),” Lt. Cmdr. Jeff Creighan, who works for Navy Personnel Command’s aviation officer distribution office and will now lead the Professional Flight Instructor program, wrote in a Navy blog post. “The PFI program is being implemented to improve retention by providing career flexibility, assignment stability for selected officers/families, and rewarding experiences training our newest Naval Aviators. The program will also significantly improve instructor manning levels in Chief of Naval Air Training (CNATRA) commands—better leveraging the fleet experience and instructional skills of officers who otherwise may have left service for civilian opportunities,” Creighan’s post continued. Miller, who took command of the naval aviation community in January, said in his first site visit that his new priorities would be “warfighting and people, and the readiness of both.” He addressed retention during an all hands call with aviators at the Naval Aviation Warfighting Development Center, noting increases in flight pay and other incentives to keep aviators interested in continuing in the Navy despite ample opportunities to take a job with a commercial airliner with good pay, no risk of combat, and no at-sea deployments to take them away from their families. Miller told the crowd that, ultimately, he thinks the decision to stay in the Navy comes down to whether the officer feels fulfilled in his or her job. “I still wake up with a passion for this business, and it’s meaningful. I still think, in the positions that I’ve been given, that I can make a difference. And I’m still having fun – this is rewarding,” he said, noting that he would work to ensure other naval aviators felt the same way – with a push to increase jet material readiness and therefore pilots’ flight time being a big part of that. Lt. Cmdr. Scott Urbashich, an instructor pilot assigned to Training Squadron 28 (VT-28), left, and Capt. 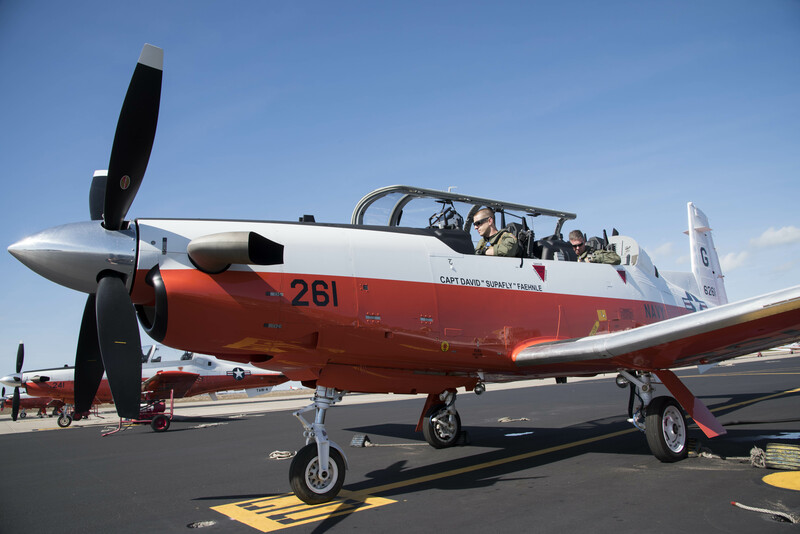 Trey Hayden, Training Air Wing (TRAWING) 4 Commodore, preflight the last T-6B Texan II in production aboard Naval Air Station (NAS) Corpus Christi on Feb. 1, 2018. NAS Corpus Christi acquired the plane from Beechcraft, making it the 97th plane in the base’s fleet. US Navy photo. The first board to select the first professional flight instructors will convene on Nov. 20, and applications to be considered for a PFI spot are due by Nov. 13, according to the NAVADMIN. Accepting a position as a PFI means the officer will no longer be eligible to be considered for command, but the officer would be eligible for statutory promotion board consideration. The officer would also be allowed to remain in the program until retirement or until a voluntary withdrawal from the program, according to the blog post. To be eligible for a spot, a pilot or naval flight officer must have completed or be currently serving in an operational or operational-training aviation department head assignment, completed a flying tour in aviation production, have a projected rotation date in calendar year 2019, and have at least 36 months remaining before the statutory retirement date.